Falling demand for new gold causedimports in 2018 to drop 14 per cent from the year before to 756.8 tonnes, the World Gold Council said. Scrap gold supplies in India, the world's second-biggest consumer of bullion, may increase this quarter as a rally in local gold prices has prompted consumers to sell old trinkets and jewellery. Rising scrap supplies are likely to cause gold imports to continue to fall this year which could weigh on global prices that are trading near their highest since the end of April. Falling bullion imports could help reduce India's trade deficit and support the ailing rupee. The country's scrap supplies for the quarter ending in March are forecast to rise above 25 tonnes from 14.1 tonnes during the same period a year ago, said Surendra Mehta, secretary at the India Bullion and Jewellers Association (IBJA). The gold price rally has been encouraging consumers to book profits on long-held supplies as many think current prices may not be sustained, Mr Mehta said. Gold prices on the Multi Commodity Exchange of India have jumped more than 11 per cent in the past six months and were at 33,035 rupees ($464.65) per 10 grams (0.32 troy ounces). Temples and households in the country own more than 24,000 tonnes of gold, which consumers typically buy during weddings and religious festivals such as Diwali and Dussehra. In Mumbai's Zaveri bazaar, biggest bullion market, tiny shops that buy old jewellery were crowded even as high-end jewellery shops were waiting for customers. "Consumers want to sell before prices correct. There are a few investors who are also selling coins and bars," said Ashok Jain, proprietor of Mumbai-based gold wholesaler Chenaji Narsinghji, which buys old jewellery. Many consumers have been exchanging old jewellery as they cannot afford to make wedding purchases at the current price, Mr Jain said as he rubbed an earring against a stone to test its purity. "There was old jewellery that we were hardly using. As right now prices are attractive, I decided to sell it," said Mr Parmar, who sold 40 grams (1.3 ounces) of gold worth of 132,000 rupees ($1,857). Two-thirds of gold demand comes from rural areas, where jewellery is a traditional store of wealth. But farmers' earnings have been squeezed recently due to falling crop prices. Farmers have limited disposable income to make big-ticket purchases like gold, said Mangesh Devi, a jeweller in the western state of Maharashtra. Cane farmers are owed 20,000 crore rupees ($2.8 billion) by sugar mills. 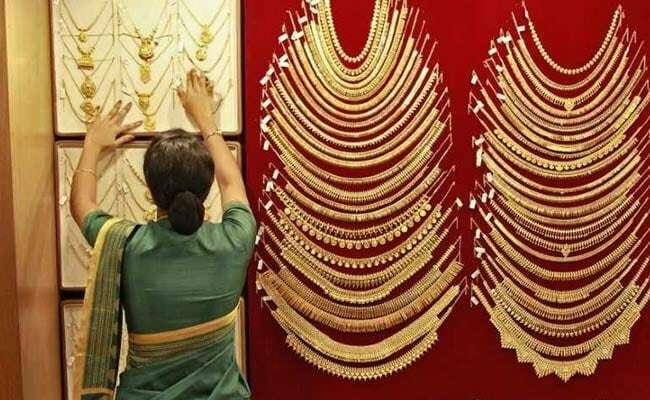 Falling demand for new gold caused imports in 2018 to drop 14 per cent from the year before to 756.8 tonnes, the World Gold Council said in an estimate released last week. "Import requirement has been falling due to the scrap supplies," the dealer said. "Jewellers are cutting purchases from banks. They are getting a decent amount of supplies from scrap."